I lived most of the years leading into second grade in a townhouse on the west side of Indianapolis. We had a small fenced-in patio with a tiny patch of earth where my father would plant all kinds of things. The patio was the home for many of Dad’s souvenirs from his hunting trips that my mother wouldn’t let inside the house. Once we had a huge snapping turtle out there – I remember watching in horror as the reptile snapped a thick branch like it was candy and worrying that my dad’s construction-boot covered foot was next. Thank god the zoo wanted the beast. My dad was a hero with his donation. A stray beagle I named Queenie made her home there for a time, but that was short-lived, too. No dogs, Mom said. Then there was a little duckling with the softest down that swam in my blow-up wading pool until it died in the heat – a sad day for me. But my father’s pride and joy was the garden he planted every year between the concrete and the fence. Every summer I looked forward to the sunflowers most of all. My dad grew the biggest, tallest, most insane sunflowers you ever did see. And every year I watched in amazement as those tiny black and white seeds grew… and grew… and grew… like a magic beanstalk, the towering plants reached well over the top of the privacy fence and the heads became so heavy with seeds that they bent down as if to show off their beautiful faces to this small child who stood in wonder before them. This morning I headed out for my Sunday long run and set off on my usual route into the countryside. I said hello to some folks in town and then gave a nod to some cyclists and farmers in pick-up trucks on the way out. I passed a team of men harvesting watermelons from a local farm, and responded to their waves with a smile and wave of my own. I felt wonderful today. Just as I left the watermelon fields, I spied a huge section of golden-topped plants in the distance across the road. 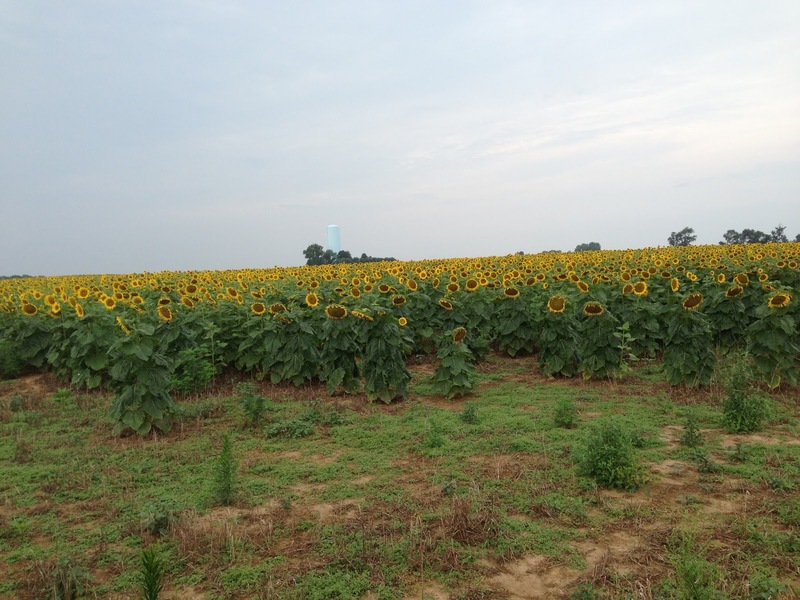 I couldn’t think of anything else it could be besides sunflowers, so I dared to leave the designated route and headed down a private dirt path to check it out. There were thousands of them, as far as my eyes could see. There, in the middle of my countryside! My favorite flowers lit me up from the inside out, just like they did when I was a little girl. Magical yellow happiness. 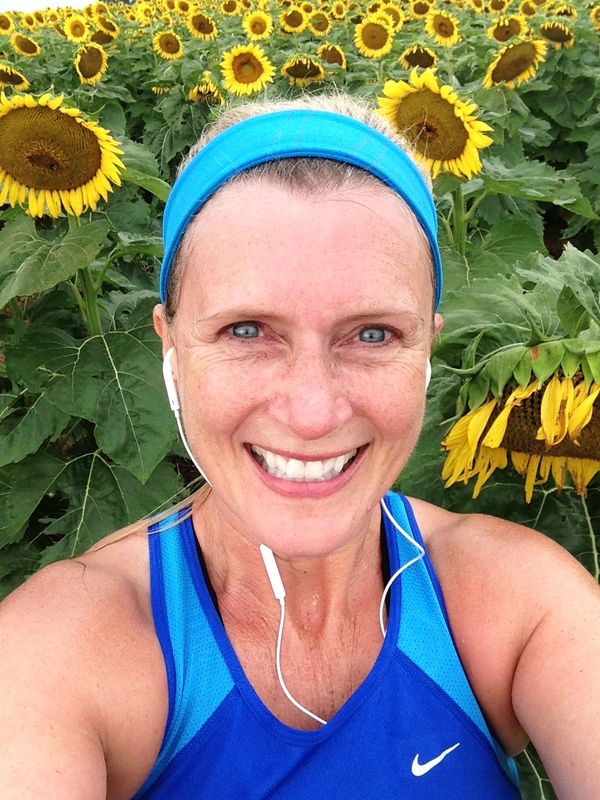 Today’s run spoke to me, and finally I heard a story other than, “I hate running fast in the hot sun.” I thought about what I would have missed if I had my head down, committed to a particular pace for a particular goal. I’m afraid I wouldn’t have even noticed the sunflowers at all. Running is Living, for me. And today I realized that I do enjoy the journey, and it’s not all filled with suffering all the time, especially if I’m willing to slow things down and just enjoy the run. It’s okay to change course in the middle. It’s great to try something new. 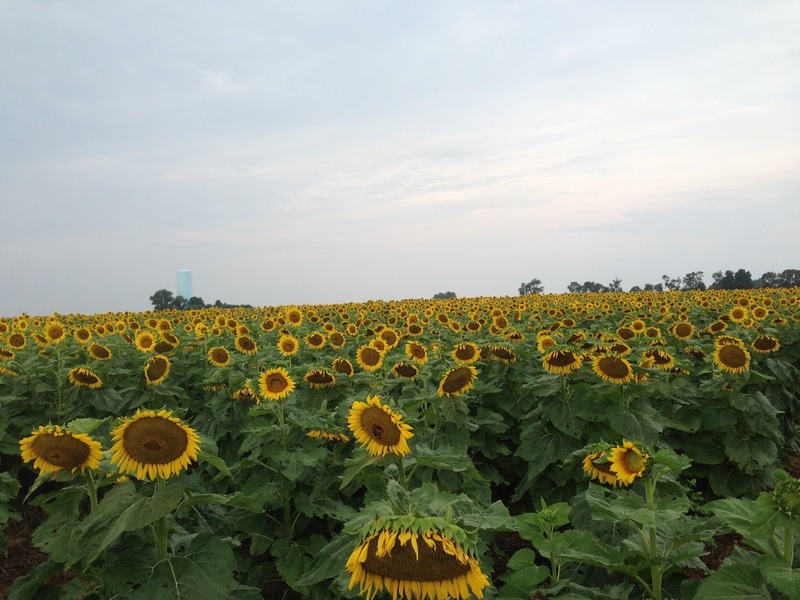 It’s beautiful to stop and see the sunflowers. This is where my heart is – in the long runs. In the process. It’s the run I love, not the finish time. And sunflowers. I still love sunflowers.